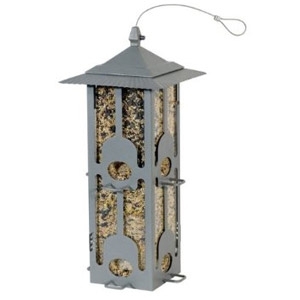 The Perky-Pet® Squirrel-Be-Gone® Wild Bird Feeder features six feeding ports, U-shaped perches and a 6 lb. seed capacity. The feeding ports have sturdy metal perches that allow birds to feed comfortably but, when the squirrels perch on them, their weight causes the entire metal casing to slip down, completely blocking the feeding ports and their access to the seed. The interior seed tower is surrounded by rustic metalwork.